Usage Data: includes information about how you use our website, products. 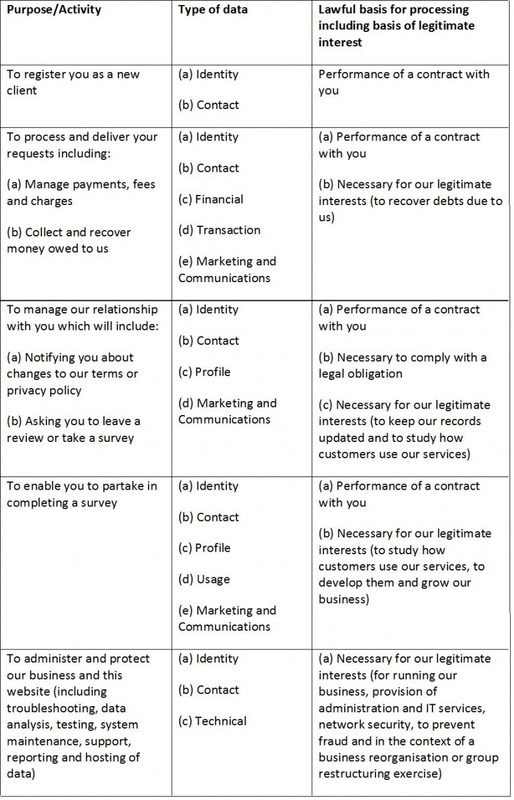 Where we need to collect personal data by law, or under the terms of a contract we have with you and you fail to provide that data when requested, we may not be able to perform the contract we have or are trying to enter into with you (for example, to provide you with goods or services). In this case, we may have to cancel a service you have with us but we will notify you, if this is the case, at the time. We will only use your personal data for the purposes set out below. Additionally, if at any time you wish us to stop using your information for any or all of the below purposes, please let us know by contacting us at info@edcoms.co.uk. Personal data provided by you when contacting us or registering to receive our newsletter is not used to track your visits to the site. Generally, we do not rely on consent as a legal basis for processing your personal data other than in relation to sending third party direct marketing communications to you via email or text message. You have the right to withdraw consent to marketing at any time by contacting us or clicking unsubscribe on our emails. Legitimate Interest means the interest of our business in conducting and managing our business, to enable us to give you the best product and the best and most secure experience. We make sure we consider and balance any potential impact on you (both positive and negative) and your rights before we process your personal data for our legitimate interests. We do not use your personal data for activities where our interests are overridden by the impact on you (unless we have your consent or are otherwise required or permitted to by law). You can obtain further information about how we assess our legitimate interests against any potential impact on you in respect of specific activities by contacting us. Where you opt out of receiving these marketing messages, this will not apply to personal data provided to us as a result of providing a service, or other transactions. Any user-submitted data in forms will be transferred securely via SSL. We have put in place appropriate security measures to prevent your personal data from being accidentally lost, used or accessed in an unauthorised way, altered or disclosed. In addition, we limit access to your personal data to those employees, agents, contractors and other third parties who have a business need to know. They will only process your personal data on our instructions and they are subject to a duty of confidentiality. This Site is intended for use by adults. If you are under 16 please do not send us any personal information including your email details. If you would like to contact us please do so through a parent or legal guardian (ask them to email us on your behalf). If you are a parent or legal guardian of a child who has submitted us with personal information, please let us know by contacting us at info@edcoms.co.uk. We will delete such personally identifiable information from our database as soon as possible following our receipt of any such notice. We do not otherwise disclose information which identifies you to any third parties for marketing purposes unless we have your prior consent. Disclosures for other purposes will occur if required by applicable law regulation, for our legitimate interest, the performance of the contract or to provide an efficient service. Third parties are parties to whom we may choose to sell, transfer, merge parts of our business or assets, if we seek to acquire, merge with other businesses, to service providers, HM Revenue & customs, Regulators and professional advisers including lawyers, bankers, auditors and insurers. Where this is the case, we require all third parties to respect the security of your personal data and to treat it in accordance with the law. We do not allow our third-party service providers to use your personal data for their own purposes and only permit them to process your personal data for specified purposes and in accordance with our instructions. Data Retention: How long your personal data will be used? You represent and warrant that all information you provide to us shall be truthful and accurate and shall not violate the rights of any third party. By using the Website and submitting information, you consent to: the collection and use of your personal information by us as described above. If you have any requests or questions regarding this policy please write to EdComs at Studio 1.19, Canterbury Court, 1-3 Brixton Road, London SW9 6DE or contact us by email using the following address: info@edcoms.co.uk. © EdComs Limited 2018. All rights reserved.